Justin Mifsud explains his passion for web usability, and how web and app prototyping tools fit into the perfect user experience mix. Back in 2011, UX and Usability Consultant Justin Mifsud decided he needed to spread the word about something he was passionate about – bridging the gap between theory and practice in web usability. 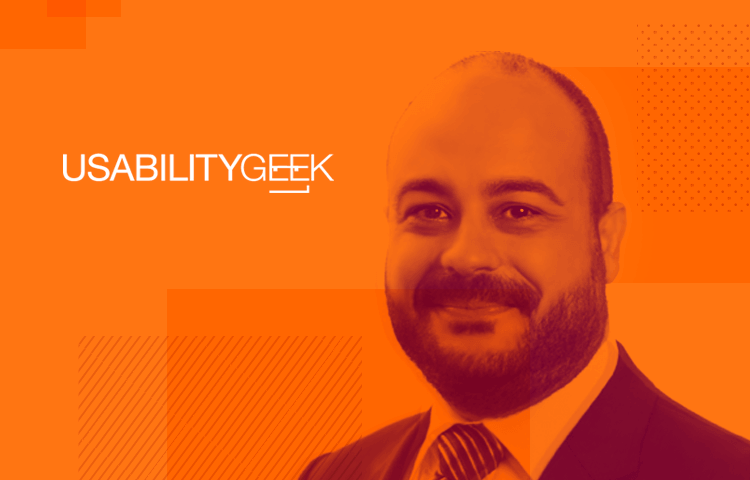 So he started UsabilityGeek, a personal blog which blossomed into a go-to reference for usability and UX matters across all platforms. UsabilityGeek now has a loyal following of around 60,000 readers a month and covers topics from user experience to computer interaction and information architecture, although web usability remains at the core of the site and what it does. When he’s not being a web usability guru, Justin directs Accreda Ltd and works out of Malta as a consultant to large organizations, offering expertise on user research, user/task analysis, user interface design, prototyping, heuristic reviews, interface guidelines development and iterative usability testing. Justinmind caught up with Justin to get his perspective on web trends past and future, the challenges of making enterprise software usable, and his expert tips on usability testing prototypes for maximum payback. What got you interested in web design and usability, and why did you set up UsabilityGeek? I have always been fascinated by the UI aspect of software – as far back as 1994 when I was studying my Ordinary Level (we use a UK education system here in Malta) in Computer Studies. I remember that at the time we were coding in BASIC and some of us first decided to experiment with coloured text on coloured background rather than the standard, MS-DOS like interface. From there we proceeded with creating very simple pixel-based graphics using nested loops. This of course was very basic (no pun intended). Although I always knew that the web was the path for me, I eventually obtained a degree in Marketing since at the time there were very few software development opportunities here in Malta. At the same time I taught myself Photoshop, HTML and CSS and ran a small part time web design freelancing business whose income I used to support my studies. This is definitely the time where my fascination with the web user interface grew exponentially. So I quit my marketing job and joined a small web development company, eventually climbing the ranks until I was managing the web development team while still designing and developing the UIs for websites and web-based applications. At the time I also obtained my diploma and degree in Computing & IS with Goldsmiths University of London. It was around about 8 years ago, while reading the degree that I specifically branched out into usability – an area that was also the basis for my thesis. From then there was no turning back. After a couple of years I joined Accreda, the company which I today manage, and also read a Masters Degree in HCI with the University of Hertfordshire. UsabilityGeek was conceived in 2011 when I had obtained my degree. I remember that at the time it struck me how much material was available in the form of research papers in digital libraries such as those of the ACM and the IEEE – research that could readily answer most of the difficulties faced by the development team I was managing. Being academic in nature, it was not the opinionated research that was found on multiple web design blogs but of course resided in subscription-based repositories. So I went ahead and shared that research, but I noticed that the developers were finding it difficult to apply the theory in their everyday work. That is what specifically inspired me to start UsabilityGeek – to bridge the gap between usability theory and practice – an objective it still holds today. Prototype better and test faster. Download Justinmind. What changes or trends in UI design have you seen in the 5 years since you started the blog? It depends on how deeply one tackles your question. If you take the core trends and the reasoning behind them, I would say not much. Remember that although technology advances rapidly, humans do not evolve as fast. Way back in 2011 we were already talking about major UI trends such as grid layouts and responsive web design. We had already debunked UI myths such as the fold or the 3-click rule. With regards to UI implementation itself there was already the use of big images and experimentation with typography. I would say that only a few UI elements and trends would make something designed in 2011 look old and outdated as a whole. For example at the time there was a trend to use textures as backgrounds as opposed to the minimalist approach of today’s UI. It was also very stylish to use 3D UI elements such as shadows or peeled-off sticker effect with icons – which contrasts sharply with today’s flat UI. Plus there was a boom in giving websites a retro-feel. Yes, UsabilityGeek had all of these when it was launched! Although technology advances rapidly, humans do not evolve as fast. What role do prototypes play in creating usable, enjoyable web experiences? Unfortunately, I would say that power of prototyping is still mostly underestimated within the industry. For a number of stakeholders (and that includes some designers) a prototype is just a wireframe, or at best a mock-up of how a website will look like. While beneficial, wireframes and mockups do not yield the benefits that a prototype would. For instance, one must bear in mind that not everyone can visualize a design or a functionality from mere text, wireframes or mockups. This will help you ‘sell’ your design concept more easily and serve as a beacon that aligns all stakeholders on what the website (or a component of it) will look like. Additionally, prototypes can help you explore different ideas and assess the feasibility of a web project even before any detailed design elements come along (let alone development). This of course ensures that the most optimal design is chosen from a number of different approaches – and by optimal I mean one that users will find easy and pleasant to use while achieving their objectives. It also means that even if that design is not complete, prototypes allow faster iteration of a concept until it evolves to a high-fidelity design. From a commercial perspective it means less costs and more chances of success. Prototypes also facilitate communication and collaboration with stakeholders – both internal and those pertaining to the client. Needless to say they are far better than endless pages in a functional specifications document. Prototypes can be used for usability testing: all you need are an interactive prototype complete with realistic content, sample users, a facilitator and observers. The users then complete a number of tasks using the prototype. All of this results in great feedback as well as the early identification of any usability issues that can be addressed way before any development (or worse still, launch) has been carried out – meaning lower costs and faster deployment. What’s the biggest challenge to getting large enterprises to understand the importance of usable software? I would say that the challenge to convince any company to invest in usable software depends on how much the person commissioning the project understands usability and believes in its importance. Yes, it boils down to that. It is extremely difficult to convince someone of the importance of continuous usability testing and its related tweaking, with all the associated ‘costs’ both in resources and finance. It is true that the term ‘usability’ has now become a mainstream buzzword (unfortunately mistaken for ‘easy-to-use’), so one would expect executives to be familiar with it. But in reality, when it comes to actual implementation the priority shifts to rushing to go-live, making ad-hoc changes (that are unfortunately based on intuition or partial information) and maintaining development costs low. Yes, one would say (and to a certain degree this is true) that if an explanation is provided in terms of ROI and increased goal achievement, then there is more likelihood that such enterprises understand the importance of usable software. I would say it is a chicken and egg situation: to be convinced, enterprises need to see something tangible, but to see something tangible they need to seriously invest in usability first. Can you give us an example of a time an enterprise called you in to work on their software/site usability? What impact did the change have? Fewer people completing the forms. Using analytics I eliminated the first two possibilities. The site was actually ranking much better and the ‘funnel’ was implemented quite well – the content was good enough that users were understanding that they were dealing with a reputable company and intrigued to engage them. The problem was actually in the forms themselves. Heuristically evaluating the forms, conducting a number of usability tests with users (based on personas) and using software to record how real users were interacting with the forms revealed several shortcomings. The forms were long, extremely complex and littered with technical jargon. The functionality through which the forms evolved depending on what answers the user was giving were too confusing. Users were abandoning them half way through, and in some cases just moving away from them when they saw so many questions. The forms were even more overwhelming when viewed on mobile. As if this was not enough, we found out that during the problematic period in question, there was a surge in the number of requests being made by phone or conventional email. Users were literally abandoning the forms. By focusing on collecting only the essential information, we drastically shortened the forms and overcame any ‘suspicion’ that was unnecessarily triggered in these prospective clients. However, this was not done at the expense of allowing anyone to contact them. Purposeful questions were implemented that would help weed out ‘window shoppers’. The source for these was quite simple: we implemented the questions that the advisors would ask in real life. There were of course other tweaks in the UI and several continuous usability tests were implemented, but the simplification of the forms was key. The result? An increase in the number of quality enquiries and one happy customer. Do you have any top tips for testing site usability using prototypes? The fact that you are testing using prototypes is already a good thing in itself. It means you are testing early in the lifecycle. Even before one line of code has been done! That being said, I think that my best tip here is to keep it real. As with any test it is essential to recruit participants who are representative of the users you are targeting. Crafting good personas is key here. It is also important to set tasks that are similar to the ones users will perform when using the system. This means that you need to need to set realistic and actionable task scenarios that are ordered in a sequence that ensure a smooth flow of the test session. Such scenarios should be measurable, by being directly linked to one or more objectives. The realism does not stop there. The prototype should be as ‘real’ as possible. Real here is actually the relationship between the prototype’s fidelity and what you are testing. Low-fidelity prototypes are good for testing out different ideas. However, if you are restricted in the number of tests you can perform, stick to medium to high-fidelity prototypes. This is because they would naturally remove certain ambiguities in the results. For example the replacement of placeholders with real images and sample text instead of dummy text eliminate the possibility that the user is not finding something simply because the UI looks the same throughout. This is of course a simplified example but you get the feel. On the other hand if you want to focus on specific user interactions or if you want to test out complex user interactions, then testing must be done using high-fidelity prototypes. Where do you see UX in 10 years’ time? Well, 10 years is sure a long time span in this domain. That being said, the challenge will always be to use technology in such a way that will improve the UX rather than just for the sake of using it. This is particularly true in the light that as we have seen, tech in the past 10 years has evolved incredibly but the human being has not. So the distance between these two evolutions will continue to widen as time goes by. Humans will always be limited by the amount of things that they can process. So no matter how sharp our resolutions can be, no matter how small we can go with devices, no matter how complex our interfaces can be …. there is a limit of how much the human being can process … and that limit is no different than how much was processable 10, 50, 100 years ago. What has changed though is the human’s ability to recognize familiar patterns – users expect things to look like and behave like a certain way. So I think that as time goes by there will be less chance of amazing users. On the contrary, good UX will be more expected. Users will become even less tolerant than they are now just as now. With regards to specific technologies, I think that the IOT will become even more seamless with vast improvement in natural language interaction. This would of course need to be matched in advances in artificial intelligence. The traditional concept of how humanoid robots will become a science fiction thing as these smart ‘beings’ will be seamlessly integrated in everyday objects without having to possess any human-like physical attributes. Simplification and minimalism in UX design will be taken to more extremes with focus on micro-interactions and systems that seek to preempt user interactions. A worrying aspect that I see is that there is a vast gap between educational programmes and the market need – something that already exists today. Educational institutes are generally slower to adapt so I think we might see even more companies setting up their own learning institutes and the emergence of more industry-trained UX specialists. That being said, I see exciting times ahead and great opportunities of course.